This Creamy Crock Pot Macaroni and Cheese recipe makes for the perfect side dish, party appetizer, or slow cooker dish to bring to a potluck! Great for summer when you don’t want to heat up your kitchen. First, let me just start out by saying: look at how perfectly creamy this macaroni and cheese is! Because I don’t leave my crock pot out on the counter since it takes up way too much space, I tend to forget about it sometimes. It really is a life saver in the summer because I don’t have to heat up my house by turning the oven on, and that fact sure is appealing especially when the temperature outside is hanging out in the 80’s! Normally, people go slow cooker crazy during the fall and winter (a plethora of soups, stews, etc.) but they really are just as useful in the summer…whether it’s for picnics, keeping your side dish warm, potlucks, whatever! Get a slow cooker here for pretty cheap if you don’t already have one – I love mine! This is a great cheap and easy fix for your mac ‘n cheese craving when you don’t want to deal with all of those expensive cheeses other recipes call for. It was creamy and tasted just like the old fashioned comfort food you look for with a meal like this! It would be perfect for a large family get together or cookout and I love that it can be a side dish OR used as the main course (add some meat if you want to make it more of a “meal”. We ate it as is). Note: -Cook the pasta to al dente – the pasta will continue to cook in the cheese while in the crock pot. – Stir the macaroni and cheese occasionally so that the cheese mixture stays creamy and does not stick/harden. This won’t affect the cooking time if you lift the lid a few times to give it a good stir. Creamy Crock Pot Macaroni and Cheese recipe makes for the perfect side dish, party appetizer, or slow cooker dish to bring to a potluck! Great for summer when you don't want to heat up your kitchen. Boil the macaroni in a 2 quart saucepan in plenty of water until al dente, about 7 minutes. Drain. In a slow cooker, combine cheese/butter mixture and add the eggs, sour cream, soup, salt, milk, mustard and pepper and stir well. Add drained macaroni and stir again. Set the slow cooker on LOW setting and cook for 2.5 to 3 hours, stirring occasionally. Note: be sure to stir the macaroni and cheese a few times so that the cheese mixture stays creamy and does not stick/harden. 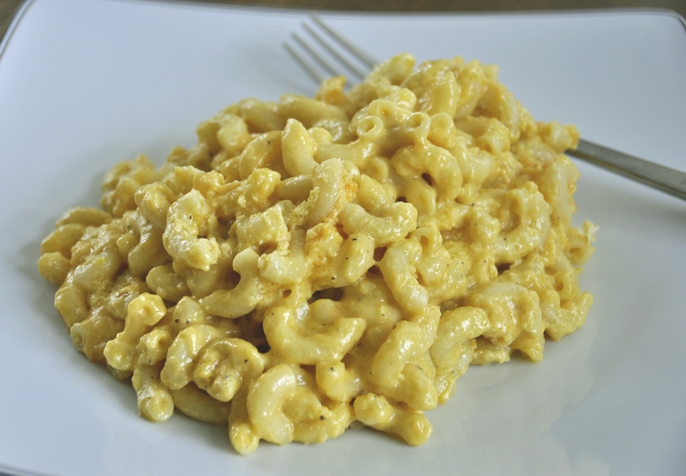 Crock pot macaroni … I think this would be my daughter’s idea of a plate of heaven!!! This looks so incredibly cheesy! If I made this for my toddler, she would scream for joy. The woman is a mac and cheese fanatic and asks for this at every meal. I love that this is a crockpot recipe – no messing around with the stovetop! Thanks for taking the time to comment. Sorry this method doesn’t work for you. I hope you find something that does! I have never made mac and cheese on the stove top. Always in the oven and always homemade. Never boxed, so this looks really good to me and not having to turn on the oven this time of year is a plus. Thanks, Kim! 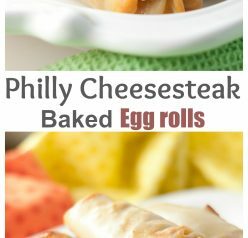 It’s definitely different from oven-baked but it’s a yummy dish and quick and easy! I love making mac and cheese in the crock pot! This one looks wonderfully creamy. Hope you have a wonderful week Ashley! Love that this doesn’t come out of a box! Fabulous homemade mac n cheese! oooooh this is the creamiest mac n cheese I’ve ever seen!!! Looks delish! Mac n cheese is one of my all time favorite comfort foods! This looks amazing and making me hungry! This is the kind of macaroni and cheese I love! So creamy! I don’t have a slow cooker, but if I did, I don’t know where I’d put it. I have pots and pans and electronics everywhere. 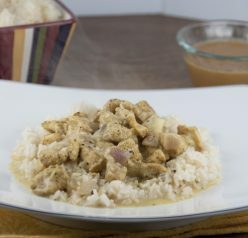 Oh my goodness comfort food all the way and in the crock pot even better! The creamier the better! Looks deelish. I too use my crockpot in the summer. Generally for meat that we can then make sandwiches out of for dinner. 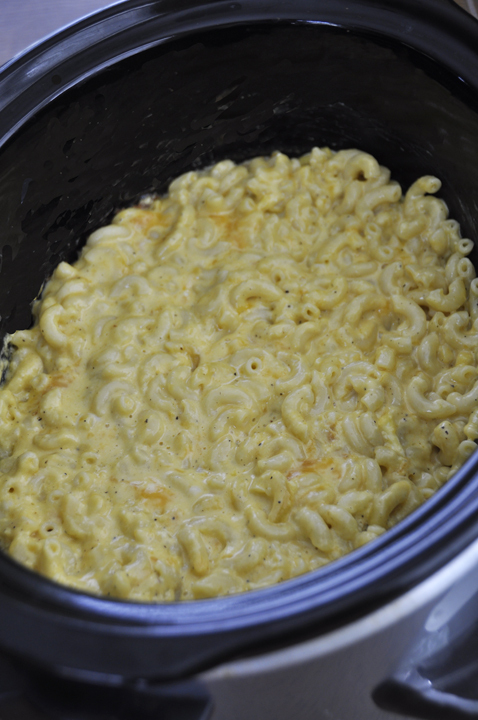 I’ve tried a few crock pot mac and cheeses, I’ll add this one to my list. I am impressed by how creamy this is! The only slow cooker mac and cheese I’ve ever made was not this creamy. Some days nothing beats a good mac & cheese! All that creaminess is sure working up my appetite! 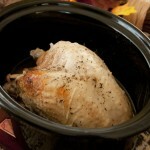 I love the idea of using the crock pot! Mac and cheese in the slow cooker! Yes please! I love mac n’ cheese, but have never tried a slow cooker version before. It’s a really great idea and I love using my slow cooker – especially when it is hot out! This looks really creamy and yummy! Macaroni and Cheese is such a favorite comfort food! Bookmarking this for busy nights — looks perfect! My kids will LOVE it. I’m a giant mac and cheese fan so I need to try this asap! I could literally eat mac and cheese EVERY DAY! 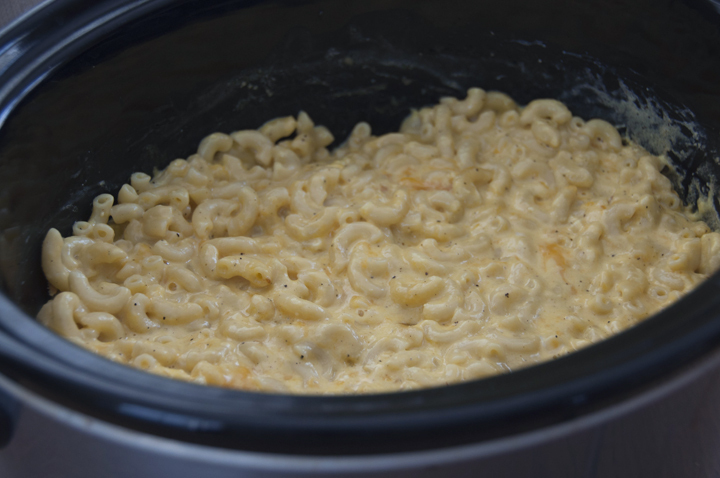 I love Crock Pot Macaroni and Cheese and I love your version! Like you, I never use my slow cooker. I really should and there is nothing more comforting than creamy mac and cheese. Anything in the crock pot is my friend, make is mac and cheese and I’m in LOVE! Does it get much better than macaroni cheese? I had no idea you could make mac and cheese in a crockpot! I keep my crockpot stored too, so I forget about it all the time, which is such a shame, because it makes dinners so easy! Temptation never tasted better than this delicious Italian treat. Interesting! I never would have thought you could make mac and cheese in a crockpot! I love mac n cheese. I loved it as a kid and as an adult. I also hate to admit it since I am a culinary instructor but find those cans of Campbell s’ soup to come in handy at times. They are high in sodium but I use them myself occasionally for quick delicious meals. My Tuna Noodle Florentine casserole is one I often use canned soups with and my family craves it often. I bet this is delicious and it’s quick. What could be better – well maybe less sodium and fat, but hey, every once in a while isn’t going to hurt anyone. Thanks for sharing this, I’m sure I will try it. You’re right – it’s definitely a “once in a while” meal!! i just made one with my homemade lamb pancetta, damn delicious!!! Okay, I seriously need to get a crock pot!! I make a lot of homemade mac and cheese for my kiddos, but I’ve never made in a crock pot. Looks like a great time saver! For those complaining of having to use the stove to cook the macaroni…..cook up extra macaroni (I cook 2 boxes) halfway when it’s cold outside, cool it and freeze it in portions. When you want to make this, pull out a bag of frozen macaroni, toss it all in the crock pot. This look absolutely delicious!! What size crockpot do you use? Thanks! Oh my word, cannot wait to try this! It’s apparently National Drink Wine Day (?) – mac and cheese goes great with wine, right? Yum! This looks amazing! 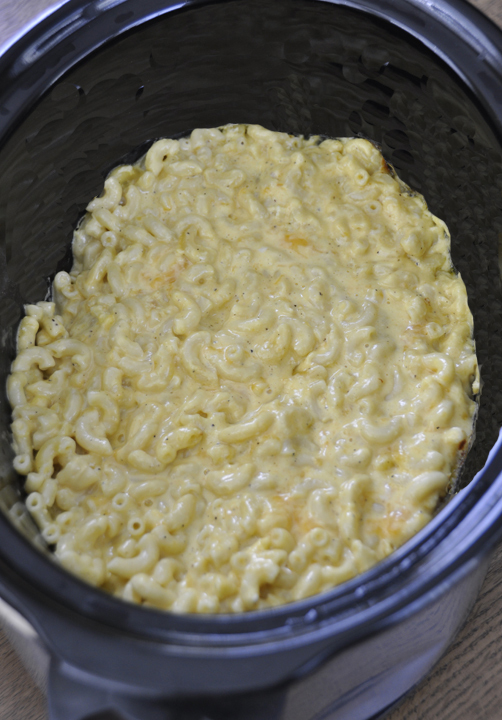 I use my crockpots all the time and have wanted to try mac and cheese in it! If it doesn’t turn out creamy enough what could I add more off, canned cheese soup? I always seem to make things to dry! I made this for part of our Christmas dinner and it was one of the first dishes gone! Excellent and easy. Stirring is a must. Yum! This is very different from the way I normally make Mac and Cheese, but I tried it over the weekend and my family and myself thought it was wonderful. Even better than my way. At first I thought cooking first was going to be a pain and dirty too many dishe, but I didn’t mind it at all. Since it had awhile in the crock pot, there was plenty of time to clean up and prep the rest of the meal. Totally worth the minimal time it took to prepare. Low on my crock pot isn’t as low as other crock pots I’ve owned, so for me, this only took 1.5 hours to cook to perfection. 5 if 5 stars from me! Any thoughts on doubling the recipe in a 6 quart crock pot? I never would have thought to make mac and cheese like this! I made this last weekend! So yummy! My daughter just could not get enough of it! This is the ultimate side dish! I make this year around. A fantastic main or side dish! Can’t go wrong making this! what a delicious (and easy to make) recipe. My family loved it.